Seaview is in the arctic to monitor a foreign power's test of what is rumored to be a suitcase-sized proton bomb, and the explosion, even at a distance of 20 miles, is tremendous. Subsequently, the premier of the small oriental country responsible for the blast, has the American scientist defectors who helped build the bomb, executed. Or so he thinks, for somehow, miraculously, one of the scientists, Dr. Everett Lang, escapes and wants to defect back to America -- and will only do so Admiral Nelson and Seaview. Crane rendezvous with Lang and manage's to get him out -- although at the expense of a souped-up junk and the lives of several agents. Mowed down by machine gun fire--remarkably bloodless deaths. 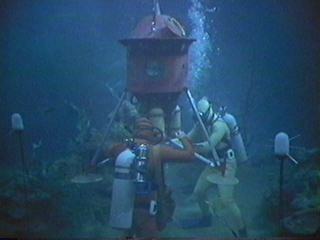 Crane and Lang are retrieved by Seaview and proceed to a spot where a big version of the bomb is hidden on the sea floor. Lang reveals that he foolishly believed the premiere wanted to bring about peace, rather than use the weapon offensively. He agrees to help deactivate the bomb to render it useless. 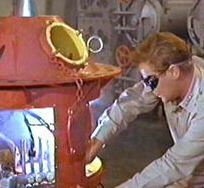 The thing has all sorts of sensors and anti-tampering devices, but Nelson and Lang manage to disarm the thing. It is then brought aboard Seaview. Problem is, Lang still wants to play God and secretly wires a detonator to the bomb. He defiantly announces it is now he who will dictate the world's actions. Lang in control. But of what? Lang announces that the world has 24 hours to disarm or he will push the button. Nelson learns that once the button is pushed, it will take 60 seconds for an ignition rod to burn through. He, Crane and several other crew jump Lang and the button gets pushed. They end up having to remove the proton cylinders so they can jettison the shell of the bomb. A terrific explosion rocks the sub, but the world is saved. Nelson scrambles to stop armageddon. 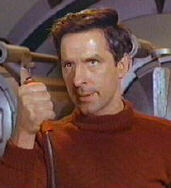 Mark Says: The very idea that someone like John Cassavetes (an acclaimed director/writer/actor) would appear on an adventure series like Voyage still boggles the mind. The dynamic Cassavetes towers over the pedestrian material and it�s a shame that the worthy idea of this episode (global disarmament) wasn�t developed better. As it stands, it�s a simple chase story that degenerates into a boring stand-off with Cassavetes threatening to destroy the world unless its leaders come to their senses. There is one great flying sub shot, as it dives towards an open field, and this shot was never used in the series again. Mike Says: It was unconscionable to bring in talent like John Cassavetes, with all of the implied power and potential to play off Basehart and Hedison, and then to simply throw it away on an insipid script directed by one of Voyage's lamest house directors (Sobey Martin). William Read Woodfield had written knock-out, bulls eye first-season scripts such as "Mutiny," "Doomsday," and "The Condemned." He had the talent and the intelligence to deliver the goods. But in season two, he was operating under the new kids-show sensibility and played down the smarts. Co-writer Alan Balter, who wrote a bunch for Mission Impossible and several Outer Limits also should have know better. Cassavetes must have been stunned by the pointlessness of it all. 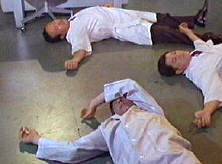 The one neat thing about the episode is the presence of genre workhorse Whit Bissell .